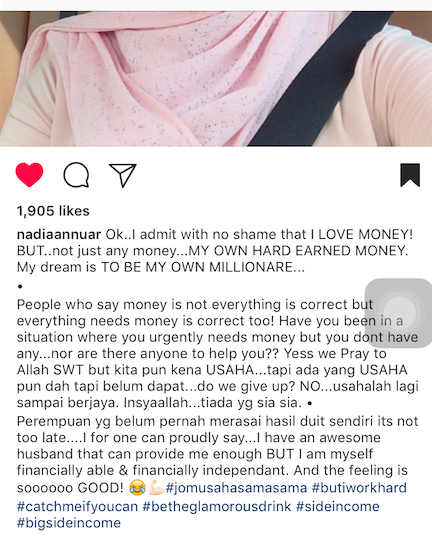 Past few days, i saw Nadia Anuar post something on instagram and it makes me smile. came up with that , i feel so thankful this day. people used to ask me why i need to work hard . why am i struggling since i already have a baby (my daughter) . yet, people know nothing. i work so hard for my future and just to ensure i can achieve my aims. people always underestimate me like i am an idiot and i am not capable in multi-tasking. so it's time for me to make a move. I swallow it more than enough till i felt bloated (their impression). Pray and make a dua' don't forget Him in your daily life. remember that He will always be with you through your up and down. I feel damn thankful because in somewhat difficulties, my injuries heart and soul , my cracking bone and my fatigue energy does make me realize that each penny that i have at this moment is always need to be in an alert zone just like a red zone. i learnt how to make savings and appreciate it since i always love to spent my money for my daughter ! The only thing i just don't get it. Why must you guys love to make a comparison between individuals? Everyone is not the same. The way of struggle is differences since it does have a method. Fate to be born in a rich family and independent , born in so-so family and struggle to become rich, born in a poor family and remain poor, born in a poor family and work so hard to change your lifestyle and become rich or to be born in a rich family and live your life with full of wealths -either you spoilt or you learn ; it's your call to be what you want to be. Just stop brag about your life (right now) . Learn how to appreciate what you have and be thankful . Manage things well . Everyone make mistakes just like i did. People change. It's you and yourself . Trust yourself so that people will eventually trust you. Keep up with the tempo. Be positive and be a better person everyday. Let it be if people talk about your past, your current life and some silly things that shouldn't interrupt you. All you need to do is trust yourself. work hard , guys.